Hooray!! It is such a pleasure to meet you! My name is Thumper!! 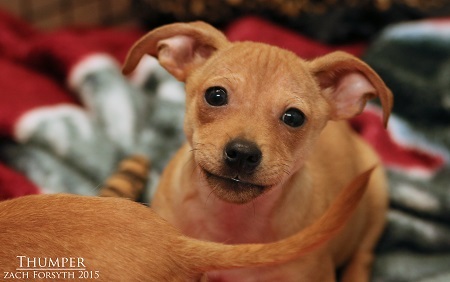 I’m a 12 week old Chihuahua/Dachshund mix (lovingly referred to as a Chiweenie) who is full of fun, and pizzazz, and happiness, and personality, and oh the list goes on and on!!! I LOVE everyone! Dogs, cats, kids, turtles and Jack-O-Lanterns. I’m actually not sure about that last one as I haven’t seen one yet, but I hear they are neato! Can you show me one when we get home? Is it too early for that? Boy, I sure have a lot to learn! My friends at Pixie Project say I will learn best at puppy school, so formal classes are a mandatory part of my adoption. What d’ya say? Want to take a fun baby boy like me home? Fill out the adoption application so we can schedule a meet and greet. I am fixed, vaccinated and microchipped. My adoption fee is $300.